All the children who participated in the first annual Uptown Games at The Armory in Washington Heights this past Sun., April 1st were winners. An afternoon of fun running, jumping, sprinting and racing, with nary a video game or computer screen in sight. The track and field event was sponsored by New York State Senator Adriano Espaillat, New York City Councilmembers Ydanis Rodriguez and Robert Jackson and the New York Road Runners, the organization behind the New York Marathon. The goal of the tournament was to combat childhood obesity by promoting healthy, active lifestyles for kids. 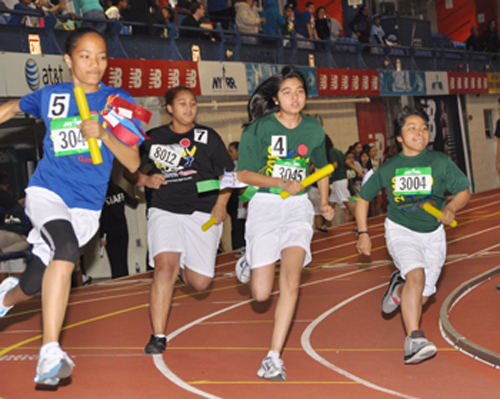 More than 250 youths from 3rd to 8th grade from 19 schools throughout Washington Heights were taught the fundamentals of track and field by members of The New York Road Runners and then given the chance to compete in races and relays on the 200 meter track in the world class facility. Read more: First “Uptown Games” promote active lifestyle for local youths | APRIL 04,2012.